My mission this year at Tucson included re-establishing some of my connections to the fire agate community– last year I finished this fire agate ring which has been drawing major compliments, so I figured it's time to try a few new pieces in our market. Often obsessed and infatuated with gems, in some cases fixated on one gem, sometimes to financial detriment, we are all bound together by our love of gems, but you don't qualify for the “Brotherhood” unless you're slightly crazy about them. To be of the “Brotherhood” doesn't mean you have to follow this particular gem, but one of my favorites/infatuations is the fire agate. 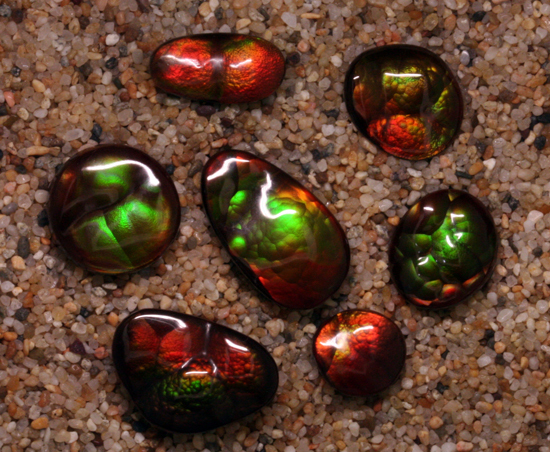 Fire agate is a rare form of cryptocrystalline quartz often characterized by a botryoidal formation (like clustered grapes), a rich brown or black body color, and thin iridescent films of other minerals which produce wondrous and mysterious colors within the agate. The best material comes from Arizona and northern Mexico. Early in my career while still working at GIA, I became friends with a miner named Larry Gray, who along with partners Howard Imboden and Guy Paul, owned the One Track Mine claims at Deer Creek, located high in the Galiuros Mountains near Safford, Arizona. These three colorful characters took wife Kaye and I under their wing and taught us about the exotic fire agates from their now famous claim–in fact we went mining with Larry and Howard in 1978 while Kaye was 7 months pregnant. As a result of our trip, I published an article entitled “The Fire Agates of Deer Creek” in Gems and Gemology, Spring of 1979– you can download a pdf at the GIA archive. I bought this particular stone from Larry Gray in 1979 shortly after the article was published. I had done Larry a major favor by helping him retrieve his prize possession. a notorious fire agate known as “Bigfoot”, from the clutches of another gem dealer, so he gave me a great price on this very gemmy Deer Creek stone. You can see pictures of Bigfoot in the G&G article, figures 12–15. One Track stones are noted for intense reds and greens, while the other claims at Deer Creek have produced spectacular greens and purples– I suspect my stone came from Deer Creek at what used to be known as the Van Dusen pit. About 15 years ago, I began carving the wax for the ring, but just was unable to complete it– it sat on my bench, 90% complete, gathering dust! Finally, something clicked last year and I was able to make the finishing touches and cast the ring. The 18K yellow gold suits the hiqh quality of the stone. I think it turned out rather well, and truly enjoy wearing the ring. While in Tucson, we were able to make the acquaintance of Bob Beaudry as well as Ryszard and Lynn Krukowski. Bob has been a major dealer in fire agate for many years and owns an absolutely fabulous inventory of top quality fire agate. 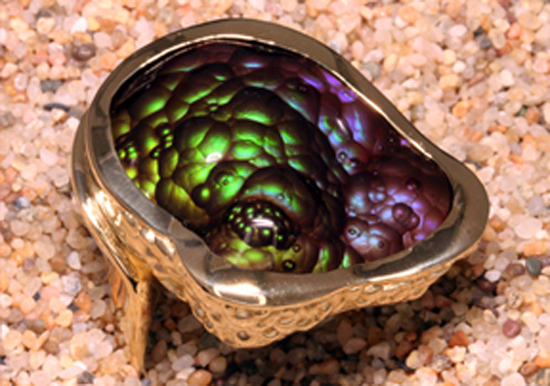 You can see for yourself at his website, www.FireAgate.com. Bob, along with Ryszard and wife Lynn now own the One Track Mine claims. Check out the Fire Agate Art Studio, where you can find wondrous works of art of carved fire agate by the Krukowski family. We purchased a few fine stones from Bob and Ryszard– you'll see them in new jewels in the months to come. We'll also be publishing more blogs about fire agate, a unique American gemstone, so stay in touch! This entry was posted on Wednesday, May 12th, 2010 at 2:59 pm	and is filed under Custom Jewelry, Gemstones, Jewelry Services, Mardon Happenings. You can follow any responses to this entry through the RSS 2.0 feed. Both comments and pings are currently closed. This is an older blog, but I want to say that your brotherhood has lead me to ‘seek’ out fire agates in our local upper midwest shows. I live in the Lake Superior agate state – MN. My husband has a fetish for finding these along roads, farm fields and of course Lake Superior. Yet, in a white elephant Christmas package at our rock club party, a few fire agate small cabs were in the box. The iridescent flash hypnotized me and it has now taken precedence over the moss agate from India that I once sought at shows. I enjoy all pictures I see on line. It has helped me identify what fire agate looks like in the rough. Some times old rockie’s have those buckets of stuff they got at auctions here in MN. With no idea of what the rock really contains. We purchased one of these for $10 at our club silent auction and found fire agate among the Mexican lace agate in the bucket. They await the work out I see people on line speak of and then later show the outcome. Thank you for all the leads you give us as to what to do with it. I too am learning silver smithing, lost wax casting to go along with my previous wire wrapping art in order to take the gems from the earth and make them into wearable pieces. I like the ring design. It suits the stone. Enjoy reading other rockies stories. Crazy, I had traveled through AZ four times in a two year span, grazed right by the Deer Creek area and had no idea that there was such beautiful stuff in them hills. Ah, that is how it goes.